Grand + Benedicts teamed up with Monterey Bay Aquarium on their new Aquarium Gift Store. Starting with customer supplied designs, G+B enhanced and refined the design through engineering and construction drawings. A custom light box tunnel that shoppers can enter, illuminates the aquarium images to create a unique “under-water” experience. We employed some phenomenal materials for this space including sandblasted glass etched with custom artwork to deepen the identity of the space. Stone covered, illuminated cash wraps defined the space further. All fixtures were built by Grand + Benedicts. Our Burnside Fixture Line has arrived in Vegas! NHL team store, Vegas Golden Knights, chose Burnside to outfit their new Arsenal store. After a few customizations including a Storm Gray finish and Slatwall Back Panels, the store achieved the “Golden” look they were going for. Incorporating custom Aluminum Slatwall Panels delivered maximum merchandising flexibility and the versatility to use Branded ice Skate Shelves. Burnside is a full line of displays available in stock in a Metallic Silver finish. Watch this video for more in-store solutions. Congrats to Jane Rogers, our new Portland Branch Manager! Let’s give a big congratulations to Jane Rogers for recently being promoted to Portland Branch Manager! Jane joined the G+B team in January 2014 where she started as an Inside Sales Coordinator and later transitioned into marketing and e-commerce. Jane’s new position allows her to do it ALL from overseeing the Macadam showroom, to managing e-commerce and distributor sales. What Jane is most excited about in her new role, is being able to work with her team as a unit and to make everyone happy and satisfied. When customers are happy, she is happy! She hopes to bring more life into the G+B showroom and allow customers to really envision what fixtures will look like in their stores. With Jane’s enthusiasm and product expertise, we hope to take the customer experience to the next level. Meet out new Branch Manager, Fred Johnson! Meet Fred Johnson, our new Branch Manager in the Seattle showroom. Fred’s passion is making a difference in peoples’ lives which he brings to everything from managing employees, to merchandising stores and serving customers. Fred joins us with over 25 years of experience in the retail and wholesale industries, and his most recent position was managing a gift store at the SeaTac airport. Fred’s first retail job was working at the Space Needle in Seattle. From there, he moved on to Made in Washington where he managed multiple stores including the visual merchandising. Fred also spent seven years in the wholesale industry assisting buyers with selecting products. When Fred is not devoting his energy making a difference in retail, he spends it on the trails hiking and snowshoeing with his husband. Join us in welcoming Fred to G+B. As quickly as the sun disappeared and the rain became the usual here in the Pacific Northwest, summer is a thing of the past and we are left bracing ourselves for the holiday shopping season and trudging on. DAZZLE! Use your displays as a “silent salesperson” by dazzling your customers and inspiring them to keep shopping. You might be amazed at how quickly those small extra purchases add up to increase your overall profit this season. Wrap it up! Do you want customers for life? Gift wrap is key. Make it simple and efficient, but beautiful. Since this is an extension of your brand, make it stand out from the other gifts under the tree. New Retail Signage Has Arrived! We have revamped our inventory of promotional cards with more vibrant colors and designs. Whether you are going for a subtle approach or a major attention-grabber, we have you covered! Our Vintage and Victorian Promotional Cards are ideal for boutiques, while the Red Burst and Retro Blue signs are great for busy environments. Printed on coated 60# and 80# cover stock, we have 5-1/2″ x 3-1/2″ signs up to 7-1/2″ x 11″. One of our new signage lines, Vintage Chalkboards, takes on a fun, unique approach with the appearance of a chalkboard. These are printed on uncoated cover stock, which allow for easy use of chalk pens (as seen below). Give these a try for versatility and get creative! An example of our Vintage Chalkboard-style sign in action! Want something different? Come visit us at one of our three showroom locations to see what else we have to offer. You can always see our complete selection of promotional signage online at www.grand-benedicts.com. Our signs on display in our showroom – SW Macadam Ave.
A retailer that really “nailed it” with the Burnside Fixture line! From simple designs to intricate work, nail art is as creative as it can be. At Got Nailed? Beauty Bar and Supply in Vancouver, Washington, they used their creativity to transform the Burnside line into the polished and high-end store experience they envisioned. Burnside is readily available in a Metallic Silver finish but was custom powder coated in a white matte finish to create an inviting spa-like atmosphere. Utilizing the Burnside Wall System, paired with the Burnside 3-Way Racks and Nesting Tables, they really nailed making the Burnside line one of their own. Lenzi Brock, owner of Got Nailed? 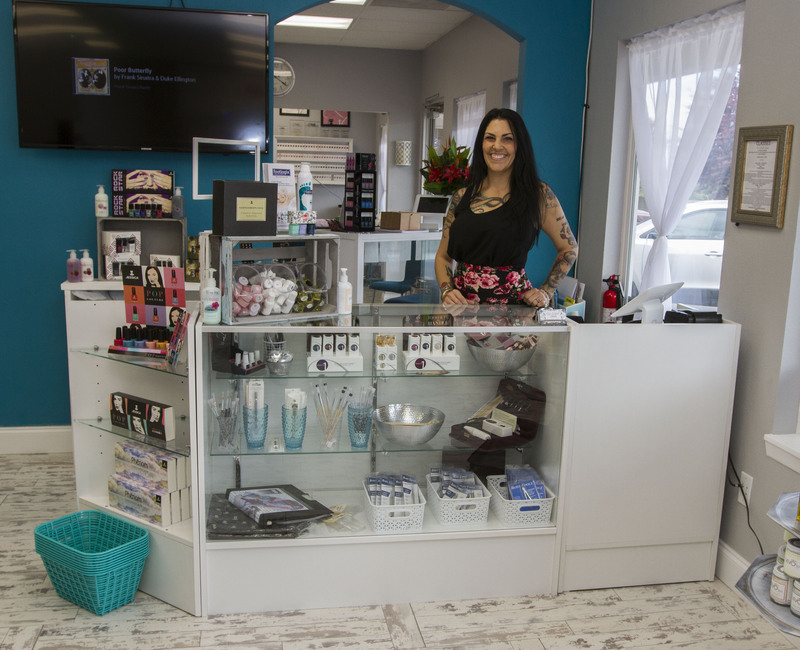 Beauty Bar and Supply, is all smiles with her beautifully designed store. The Burnside Nesting Tables shown nested with the Burnside Table Riser on top. The Burnside Wall System accessorized with shelves, drawers and graphic frames to showcase featured brands. The Burnside 3-Way Rack featured with peghooks and merchandising bins were used to display nail accessories. The Burnside collection is a full line of displays, sold a la carte, and can be customized to fit any store. It’s available in stock at Grand + Benedicts in Portland, Oregon. Welcome to Grand + Benedicts REtAiL LIFE blog. A collection of thoughts that highlight retail trends, stores we have completed and best practices. We look forward to your readership.